Home Amihan LPA Northeast Monsoon PAG-ASA Tail-End of a Cold Front Weather PAG-ASA Weather Update issue 5:00 AM today, 15 December 2017. As of 2:00 PM today, 15 December 2017 - MORE RAINS EXPECTED OVER EASTERN VISAYAS AS TROPICAL STORM "URDUJA" REMAINS QUASI- STATIONARY. At 1:00 PM today, the center of Tropical Storm "URDUJA" was estimated based on all available data at 230 km East of Borongan City, Eastern Samar (11.7 °N, 127.5 °E) with maximum sustained winds of 75 kph near the center and gustiness of up to 90 kph moving Northwest at 5 kph. 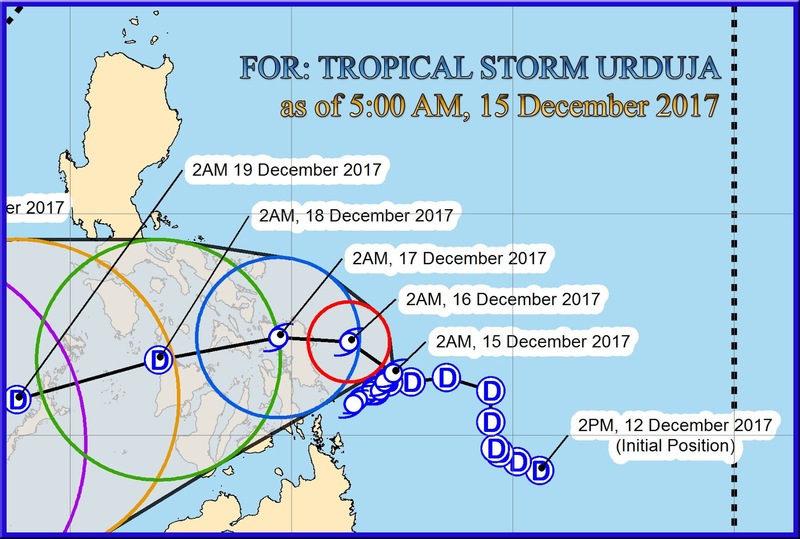 As of today, 15 December 2017 - EASTERN VISAYAS PARTICULARLY SAMAR PROVINCES ARE STILL IN DANGER AS TROPICAL STORM "URDUJA" CONTINUES ITS SLOW MOVEMENT. 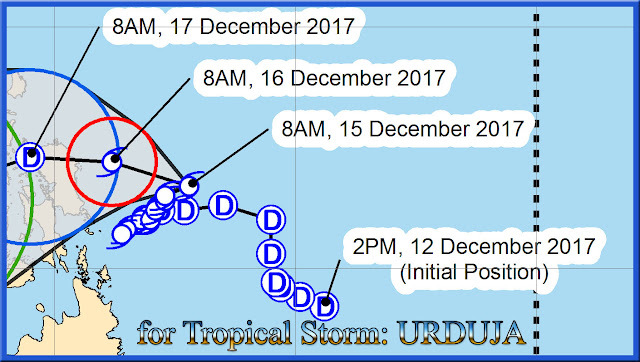 At 10:00 AM today, the center of Tropical Storm "URDUJA" was estimated based on all available data at 240 km East of Borongan City, Eastern Samar (11.6 °N, 127.6 °E) with maximum sustained winds of 75 kph near the center and gustiness of up to 90 kph moving Northwest at 5 kph. Continue Reading: PAG-ASA Weather Update - issued 5:00 AM today, 16 December 2017. 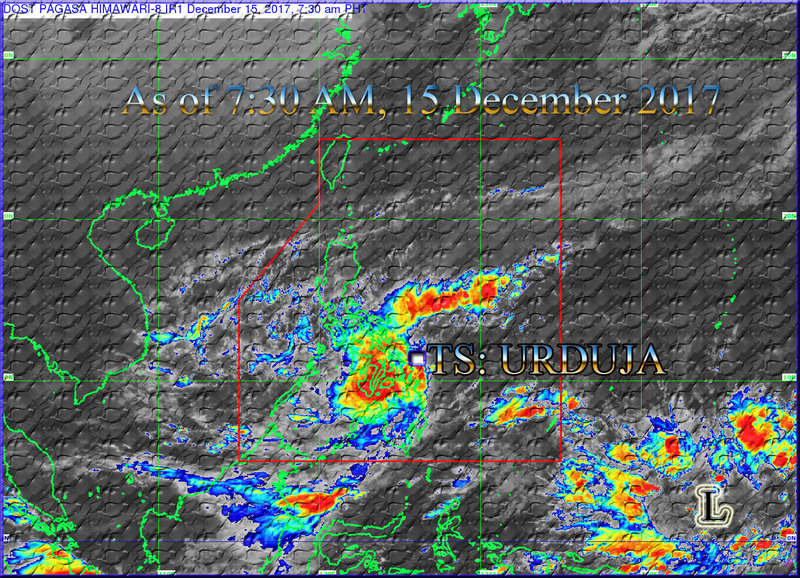 TS"URDUJA" will bring Stormy weather condition in places of Samar provinces and Biliran. 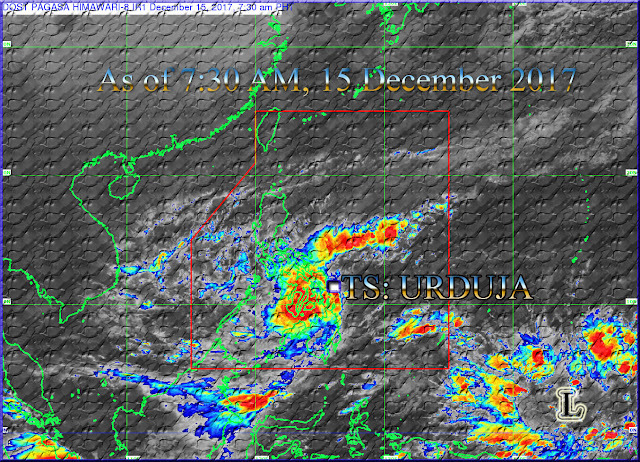 While rains with gusty winds in the rest of Eastern Visayas, Bicol Region, Romblon, Marinduque, Northern Cebu, Capiz, Aklan, Northern Iloilo, and Dinagat Islands. And Cloudy skies withscattered rainshowers and thunderstorms in the rest of Visayas and Mindanao, CALABARZON, and the provinces of Mindoro and Palawan. Mapapansin na bumalik si TS-Urduja palayo sa kalupan, dahilan kung bakit nakararanas ngayon ang probinsya ng Samar at Biliran ng masungit na panahon. As of today, 15 December 2017 - TROPICAL STORM "URDUJA" HAS SLIGHTLY INTENSIFIED AS IT CONTINUES TO MOVE SLOWLY OFF THE EASTERN COAST OF SAMAR ISLAND. At 7:00 AM today, the center of Tropical Storm "URDUJA" was estimated based on all available data at 205 km East of Borongan City, Eastern Samar (11.6 °N, 127.3 °E) with maximum sustained winds of 75 kph near the center and gustiness of up to 90 kph moving Northwest at 5 kph. At 4:00 AM today, the center of Tropical Storm "URDUJA" was estimated based on all available data at 205 km East of Borongan City, Eastern Samar (11.5 °N, 127.3 °E) with maximum sustained winds of 75 kph near the center and gustiness of up to 90 kph moving Northwest at 5 kph.